The FLUX Quartet, "one of the most fearless and important new-music ensembles around" (Joshua Kosman, San Francisco Chronicle) "who has brought a new renaissance to quartet music" (Kyle Gann, The Village Voice), has performed to rave reviews in venues of all sorts, from Carnegie's Zankel Hall and Kennedy Center, to influential art institutions such as EMPAC, The Kitchen, and the Walker Art Center, to international music festivals in Australia, Europe, and the Americas. It has also premiered new works on numerous experimental series, including Roulette, Bowerbird, and the Music Gallery. FLUX’s radio credits include NPR’s All Things Considered, WNYC’s New Sounds and Soundcheck, and WFMU’s Stochastic Hit Parade. 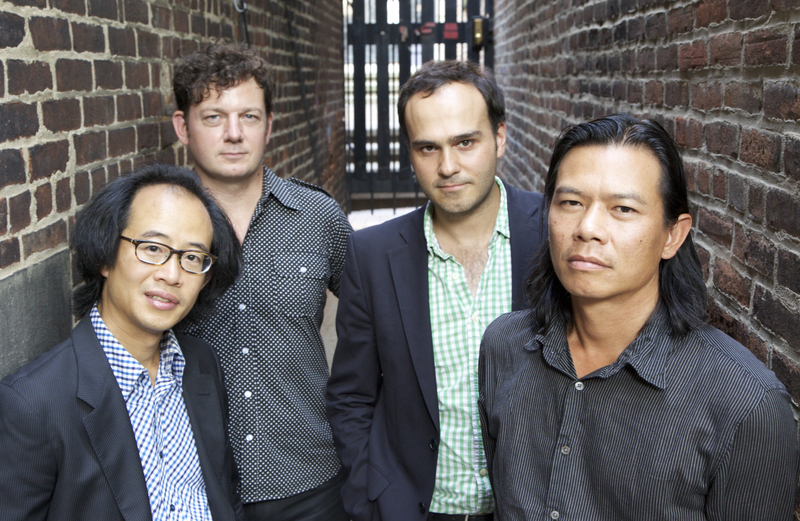 The group’s discography includes recordings on the Cantaloupe, Innova, Tzadik, and Cold Blue Music labels, in addition to two critically acclaimed releases on Mode Records that encompass the full catalogue of string quartet works by Morton Feldman. The two volumes feature String Quartet No.1 and String Quartet No.2 --- seminal large-scale late works by the iconic composer. Strongly influenced by the irreverent spirit and "anything-goes" philosophy of the fluxus art movement, violinist Tom Chiu founded FLUX in the late 90's. The quartet has since cultivated an uncompromising repertoire that follows neither fashions nor trends, but rather combines yesterday's seminal iconoclasts with tomorrow's new voices. Alongside late 20th-century masters like Cage, Feldman, Ligeti, Nancarrow, Scelsi, and Xenakis, FLUX has premiered more than 100 works by many of today's foremost innovators, including Michael Byron, Julio Estrada, David First, Oliver Lake, Alvin Lucier, Marc Neikrug, Matthew Welch; the group has also performed with many influential artists, including Thomas Buckner, Ornette Coleman, Joan La Barbara, Wadada Leo Smith, Henry Threadgill, and many more. As part of its mission to support future musical pioneers, FLUX actively commissions, and has been awarded grants from the American Composers Forum, USArtists International, Aaron Copland Fund, and the Meet-The-Composer Foundation. FLUX also discovers emerging composers from its many residencies and workshops at colleges, including Wesleyan, Dartmouth, Williams, Princeton, Rice, and the College of William and Mary. A noted champion of new music, violinist and composer Tom Chiu has performed over 200 premieres worldwide by influential composers such as Virko Baley, Julio Estrada, Oliver Lake, Alvin Lucier, Roscoe Mitchell, Somei Satoh, and Henry Threadgill, among many others. He has also worked closely with free jazz innovator Ornette Coleman, with whom he appeared at the Walker Arts Center in 2005. His extensive discography includes recordings for the Chesky, Innova, Koch, Mode, Sombient, and Tzadik labels. In a cross-discipline context Chiu has created new mixed-media works with choreographers Pam Tanowitz and Shen Wei, audio-video artists Phill Niblock and Elise Kermani, sculptor Ernesto Neto, conceptual balloonist Judy Dunaway, and director Lee Breuer from avant theater troupe Mabou Mines. He has dedicated new works to Joan La Barbara, Bobby Few, Max Mandel, the Downtown Ensemble, SLAVE PIANOS, and the OpenEnded Group, and these works have been premiered at experimental venues such as Roulette, STEIM Amsterdam, Experimental Intermedia, and the Museum of the Moving Image. He has also produced or designed sonic ambiance for special events, including gala openings at Park Avenue Armory, the Noguchi Museum, and the New York Times Building (designed by Renzo Piano). His extensive film credits further showcase his creative versatility: as composer, fiddler, voice-over artist, and actor (The Man With One Red Shoe, with Tom Hanks). Chiu holds degrees in chemistry and music from Yale and Juilliard, and has presented concerts and workshops at numerous universities, including Williams, Dartmouth, Wesleyan, and William and Mary. He appears frequently as a commentator on contemporary music and culture, and has served as panelist and consultant in a variety of artistic formats. Violinist Conrad Harris has performed new works for violin at the Darmstadt Ferrienkürse für Neue Musik, Gulbenkian Encounters of New Music, Radio France, Warsaw Autumn, and New York's Sonic Boom Festival. In addition to being a member of the Flux Quartet, he is concertmaster of the New York based S.E.M. Ensemble and the Ostravska Banda, founded in the Czech Republic. He has performed and recorded with such artists as DJ Spooky, Jean-Claude Risset, and Tiny Tim, as featured violinist on his final recording "Prisoner of Love." A solo CD featuring premiers by Alvin Lucier, David Behrman, Robert Ashley, and Gordon Mumma will soon be released on Mode Records. He has also recorded for Asphodel, Vandenburg, CRI, and Vinyl Retentive Records. Canadian violist Max Mandel is one of the most acclaimed and active chamber musicians of his generation. Comfortable in many styles and genres, Mr. Mandel's current group affiliations in addition to FLUX include The Caramoor Virtuosi, The Silk Road Ensemble, The Metropolitan Museum Artists in Concert, The Jupiter Symphony Chamber Players, The Kirby String Quartet, The Smithsonian Chamber Players, The Knights, Tafelmusik Baroque Orchestra, and I Furiosi Baroque Ensemble. Private studies at the University of Toronto and the Juilliard School were with Steven Dann and Samuel Rhodes. Mr. Mandel is a fan of all kinds of music from Mozart to Feldman to Ghostface and considers himself very fortunate to have collaborated with great artists in many genres from Vera Beths to Ornette Coleman to Kirk Hammett of Metallica. Mr. Mandel plays on a 1973 Giovanni Battista Morassi generously loaned to him by Lesley Robertson of the St. Lawrence Quartet. He resides in Brooklyn, NY. Felix Fan's versatility has made him one of the most sought after cellists of his generation. As a chamber musician, he has performed with Yo-Yo Ma, Gil Shaham, and Janos Starker, in venues such as Carnegie Hall, The Kennedy Center, Musikverein and Royal Festival Hall. Fan's interest in contemporary music has led to collaborations with today's leading composers including George Crumb, Tan Dun, Oliver Knussen, Kaija Saariaho, and Charles Wuorinen. Appearances with the Bang on a Can All-Stars has allowed Fan to work with artists as diverse as Philip Glass, Meredith Monk, Terry Riley, and Lee Ranaldo of Sonic Youth. In 1998, Fan founded Muzik3, a performance series and commissioning foundation dedicated to the advancement of modern music with an emphasis on integrating theater, dance, and video. Muzik3 led to the formation of cello/percussion/piano trio Real Quiet, which has premiered over 20 works and recorded music by Marc Mellits (Endeavour Records) and David Lang (Naxos). In 2005, Fan performed a series of radio plays written by acclaimed screenwriters Charlie Kaufman and the Coen Brothers, starring actors Steve Buscemi, Philip Seymour Hoffman and Meryl Streep. Fan has also worked with innovative choreographers Karole Armitage, Shen Wei, and Christopher Wheeldon.